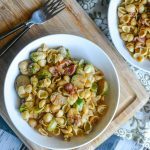 Bacon & Brussels sprouts are cooked in a simple, savory pasta skillet meal with a touch of rich comforting cream and finished off with shredded Parmesan cheese. While the pasta's cooking, cook the bacon in a large skillet over medium high heat. Sautee the bacon for a couple minutes, about two, then stir in the brussels sprouts. Continue cooking the sprouts with the bacon, stirring occasionally, about 10 minutes- until the bacon has fully cooked and the sprouts have browned. Transfer the sprouts to a plate, and set aside. Add half a cup of pasta water to the skillet, still over medium high heat, and stir to deglaze the pan. Stir in the cream, and season with salt & pepper- to taste. Lower the heat to medium, and let the sauce simmer for 1-2 minutes- just until thickened slightly. Add in the pasta, tossing gently to evenly incorporate and coat well. Season with salt & pepper, to taste if needed. Serve immediately, sprinkled with the Parmesan cheese.